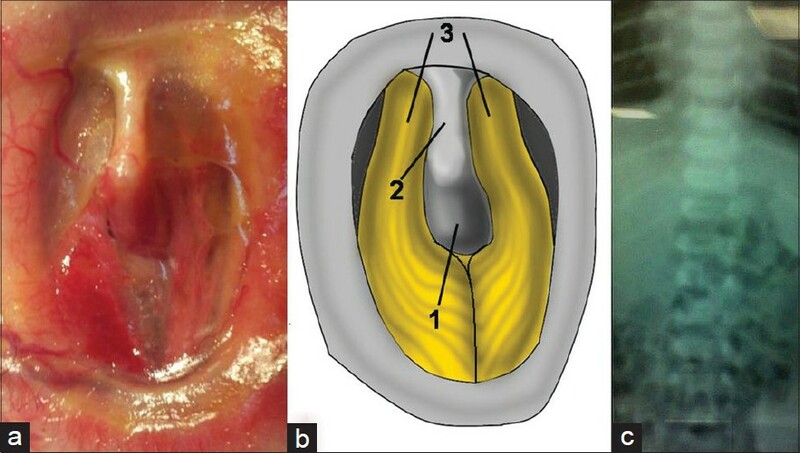 This report presents an unusual case of lumbosacral ACC associated with type I SCM. Clinical features and intraoperative findings are discussed. A full-term girl, the first child of a 24-year-old mother was born with large skin, muscle, bone and dural defect in the lumbo-sacral area. The patient weighed 2800 g. The patient was evaluated by the pediatric clinic and no other congenital malformations were found. There was no congenital malformation in the family history. Physical examination revealed no neurological deficits and the head circumference was 34 cm. The lesion showed 8 × 5 cm skin defect, covered with transparent arachnoid membrane. Underneath nerve tissue of the spinal cord was split by a perpendicular bony spur and connected from its tip to the upper lamina [Figure 1]a and b. Dura matter was seen on both sides of the lesion extending laterally over the paraspinal muscles. Common vascularization between the skin and the central neural tissue was seen. Brain computed tomography (CT) scan showed mild ventriculomegaly without signs of increased intracranial pressure. Spinal X-rays showed a bony spur on the L2 vertebral column and laminar defect in the lumbo-sacral area [Figure 1]c. Under general anesthesia and prone position, the arachnoid layer was removed and the split spinal cord was dissected from the bony spur. There was no neural placode and the spinal cord was found with full neurulation. The spur was seen extending from the posterior border of the vertebral body and penetrating the anterior dura [Figure 2]a. However, dural folds around the base of the spur invaginating between the two hemicords were seen. 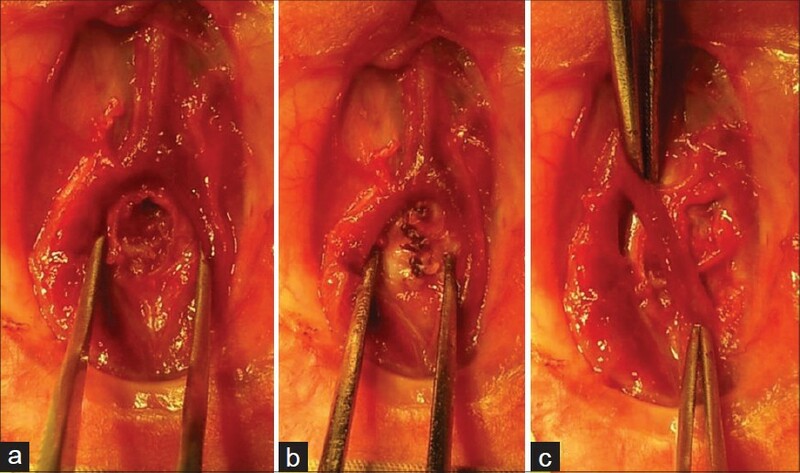 Fibrous attachment between the bony spur and the upper lamina was resected [Figure 2]b. The bony spur is then resected from its base to expose the opened anterior dura of the spine [Figure 3]a. The anterior dura was sutured [Figure 3]b, and the spinal roots were demonstrated [Figure 3]c. Posterior dura was dissected from both the sides from the subcutaneous tissue and reverted to midline and closure was done in a water tight fashion. Skin defect was large and direct approximation of the lips of the skin was not possible. A wide subcutaneous undermining was done to allow a Z-plasty-type flap closure. However, the post-operative follow-up showed necrosis in the lips of the flap. Sutures were removed in the post-operative day 10. Debridement of the necrotic lips was done and wound was allowed to heal by secondary closure with regular wet dressing and boric acid powder. No neurologic deficits were seen after surgery. ACC is a rare congenital malformation characterized by a skin defect. Although the etiology is still uncertain, a variety of possible causes such as genetic syndromes, teratogens, intrauterine infection with varicella zoster or herpes simplex viruses, fetal exposure to cocaine, heroin, alcohol or antithyroid drugs, infarction of the placenta, and amniotic pathologies are described in the literature. The incidence is 1 to 3/2000 to 10,000 and 25% of the reported cases are familial with a vast majority (69%) showing an autosomal dominant inheritance or part of a syndrome. Lesions can be multiple and on different surfaces of the body, but most of the cases have solitary scalp lesions (70%). It may often occur on the parietal and occipital areas and rarely on extremities. It can also be associated with other physical anomalies such as defects of eyes, extremities, limbs, gastrointestinal system, genito-urinary system, and central nervous system. In our case, the defect was seen in the lumbo-sacral area which is besides considered very rare. SCM is an unusual congenital anomaly characterized by sagittal clefting of the spinal cord or filum terminale. Pang et al. , proposed a unified theory of embryogenesis in which all double cord malformations result from a basic ontogenetic error occurring around the time when the primitive neuroenteric canal closes. This basic error is the key step in the formation of an abnormal (accessory) neuroenteric canal (fistula) through the midline embryonic disc that maintains communication between the yolk sac, which is of endodermic origin, and the amnion, which is ectodermic in origin. Formation of this canal permits continued contact between ectoderm and endoderm within the canal. An endomesenchymal tract condenses around this accessory canal, splitting the developing notochord and causing two hemineural plates to form. SCMs are classified as one of 2 types according to the unified theory. In type I SCM, the hemicords are always invested with individual dural sacs and the medial walls of the sacs always ensheath a rigid (bony or cartilaginous) midline spur. In type II SCM, hemicords are always within a single dural sac and the midline septum is composed of non-rigid fibrous or fibrovascular tissues. According to this classification, our case can be diagnosed as type I SCM with completely separated dural sacs and a bony spur. ACC has seldom been reported to be associated with SCMs. , In our case, the spinal cord was split by a perpendicular bony spur and connected from its tip to the upper lamina. The spur was seen extending from the posterior border of the vertebral body and penetrating the anterior dura. Dural folds around the base of the spur invaginating between the two hemicords existed. There was no neural placode and the hemicords were found with full neurulation reflected with the fully intact motor power in the lower limbs and excluding the diagnosis of myeloschisis. The coexistence of spinal anomalies may suggest a common embryogenesis. This derangement during neurulation produces a group of anomalies separately or in combination. This association of both pathologies may be explained by an arrest during embryologic development of the skin and subcutaneous tissue formation (as known for ACC) and of the regression of the neurenteric canal or the break between the ectoderm and endoderm forming the fistula due to common pathologic process, such as ischemia. The ontogenic mechanism of this rare variant remains unknown. In our case, the mother was previously healthy and there was no drug intake history which could be considered as teratogenic. There was no evidence for an amniotic band in pregnancy. There was also no significant family history. In the case of our patient it might be a coincidence. Careful preoperative evaluation is very important for the surgical planning. Recent studies demonstrated that magnetic resonance imaging (MRI) and 3D CT are useful for the diagnosis of SCM. ,, In this case, however, we approached this variant as an open dysraphism without preoperative MRI as the lesion was totally exposed and identifiable. Careful intraoperative exploration was sufficient for the identification of the anatomy and the management of this variant. 1. Gazioglu N, Abuzayed B, Aslan H, Saka O, Kafadar AM, Aydin Y. 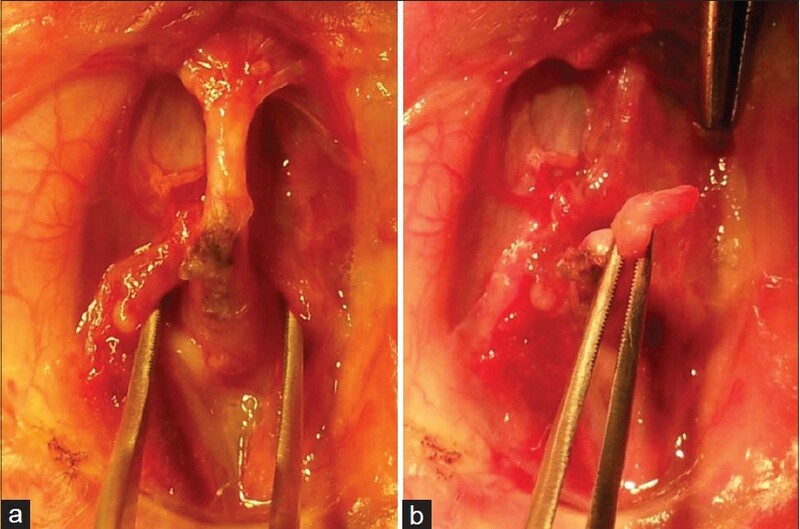 Repair of the venous sinus defect with bovine pericardium dura substitute in a case aplasia cutis congenita. Neurosurg Quart 2012;22:19-21. 2. Moriya J, Kakeda S, Korogi Y, Soejima Y, Urasaki E, Yokota A. An unusual case of split cord malformation. AJNR Am J Neuroradiol 2006;27:1562-4. 3. Pang D. Split cord malformation: Part II: Clinical syndrome. Neurosurgery 1992;31:481-500. 4. Pang D, Dias MS, Ahab-Barmada M. Split cord malformation: Part I: A unified theory of embryogenesis for double spinal cord malformations. Neurosurgery 1992;31:451-80. 5. Akiyama K, Nishiyama K, Yoshimura J, Mori H, Fujii Y. A case of split cord malformation associated with myeloschisis. Childs Nerv Syst 2007;23:577-80. 6. Yamanaka T, Hashimoto N, Sasajima H, Mineura K. A case of diastematomyelia associated with myeloschisis in a hemicord. Pediatr Neurosurg 2001;35:253-6. 7. Izci Y, Gönül M, Secer HI, Gönül E. Aplasia cutis congenita: A rare cutaneous sign of split cord malformations. Int J Dermatol 2007;46:1031-5. 8. Calikoðlu E, Oztaþ P, Yavuzer Anadolu R, Catal F, Görpelioðlu C. Faun tail with aplasia cutis congenita and diastematomyelia. Dermatology 2004;209:333-4. 9. Mahapatra AK, Gupta DK. Split cord malformations: A clinical study of 254 patients and a proposal for a new clinical-imaging classification. J Neurosurg 2005;103(Suppl 6):531-6. 10. Kumar R, Singh SN. Spinal dysraphism: Trends in northern India. Pediatr Neurosurg 2003;38:133-45. 11. Erºahin Y, Mutluer S, Kocaman S, Demirtaº E. Split spinal cord malformations in children. J Neurosurg 1998;88:57-65. 12. Goldberg C, Fenelon G, Balke NS, Dowling F, Regan BF. Diastematomyelia: A clinical review of the naturel history and treatment. Spine (Phila Pa 1976) 1984;9:367-72. 13. Ozek MM, Pamir MN, Ozer AF, Keles GE, Erzen C. Correlation between computed tomography and magnetic resonance imaging in diastematomyelia. Eur J Radiol 1991;13:209-14. 14. Ansari S, Nejat F, Yazdani S, Dadmehr M. Split cord malformation associated with myelomeningocele. J Neurosurg 2007;107(Suppl 4):281-5.